Not only does climate change pose immediate environmental challenges to indigenous groups, the large scale climate mitigation and adaptation measures being proposed also have serious impacts. 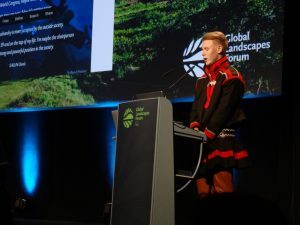 The human rights and land tenure panel at the two day COP 21 Global Landscape Forum addressed how to ensure such projects proceed in a way that respects international and national indigenous rights to land and consultation. One answer to this question came from young Sámi leader Per Jonas Partapuoli, a board member of the International Centre of Reindeer Husbandry. His family has been herding reindeer in the Laevas district since long-before Sweden was a country. “It is where I find my safety, love, identity and further where my future will be,” Partapuoli said. 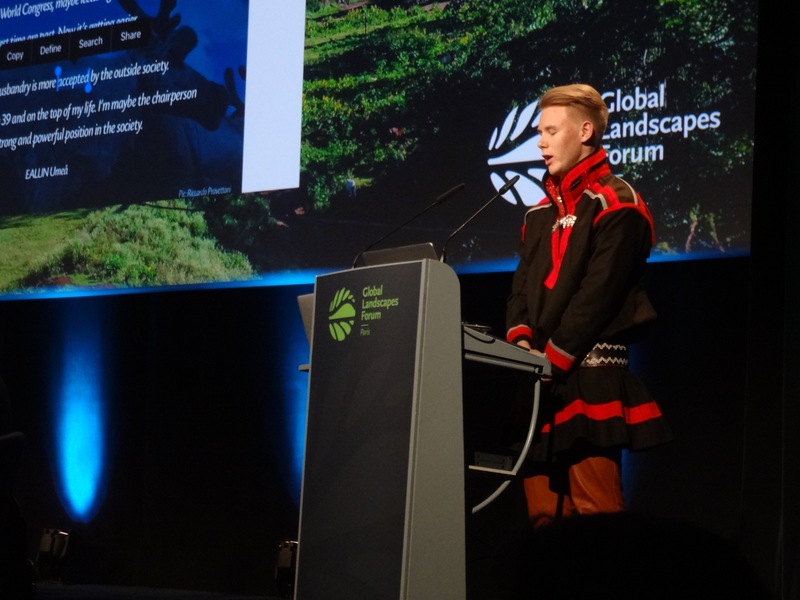 Sámi leader Per Jonas Partapuoli, a board member of the International Centre of Reindeer Husbandry speaking at the COP 21 Global Landscape Forum. His people’s Sámi territory is at risk of displacement from mining. Although Sweden has fairly good environmental standards, parts of this land will no longer be habitable and entire villages must be displaced. The displacement itself is onerous, expensive, and traumatizing. There are often no other areas to move for a culture that bases their geographic place on migratory patterns of reindeer, Partapuoli explained. Mining operations often take precedence with support from state powers. Because they are less powerful, indigenous peoples are often the ones who have to adapt. “I don’t know about coexisting; there is nothing to coexist on,” Partapuoli explained. Mining is not the only example. Joan Carling, Secretary General, Asia Indigenous Peoples Pact explained how large-scale hydropower dams, though creating clean energy, can displace entire populations. Carbon capture programs put a monetary price on “carbon” resources such as trees, running up against the intrinsic common-good, long term values of sustenance, culture and identity held by indigenous peoples. The consequences are often disastrous for indigenous people. Partapuoli described the the proliferance of mental illness, like anxiety and depression, from struggles for land and related challenges, to the extent that one in three young reindeer herders have contemplated suicide. Importantly, not all is stark. 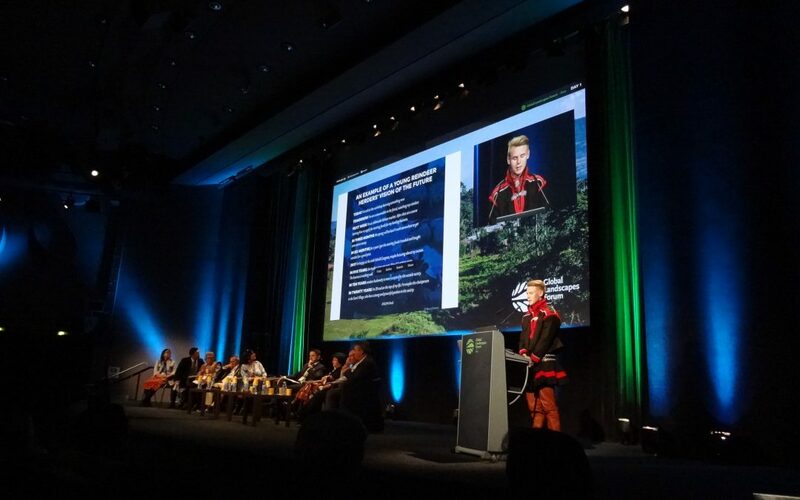 Partapuoli shared the success of the Laponian nature reserve and parks area, also a UNESCO world heritage site, now managed through traditional knowledge of the Sámi people. Decisions are often made by consensus and boards are representative of the indigenous people that live on the land. While mining also threatens this area, with negotiations with the Swedish government currently underway, the Sámi are much better equipped to stand for the rights of their children and grandchildren.